Despite The Lido Café having opened around 4 years ago, it’s only recently that it has appeared on our radar but given how popular it is amongst locals, perhaps they don’t want the rest of London to find out about this little gem! 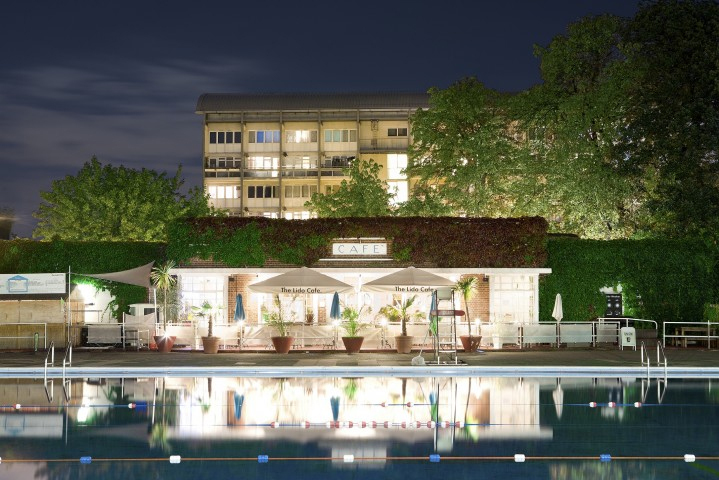 Twinkling fairy lights, a pool buzzing with lively revellers during a summer’s day or rippling in the evening breeze during a winter’s night, and simple yet delicious ingredient led food – this is what to expect at the The Lido Café, located alongside Brockwell Park’s beautiful art deco lido. The restaurant is rustic chic at its best. A worn concrete floor meets simple furniture and an occasional pot plant, whilst large windows ensure the room is filled by the radiance of the sun or the romance of the moonlight. With toasty heating and cover against the elements, the al fresco area can also be enjoyed throughout the seasons for dinner or drinks. The Lido Cafe’s brunches are already legendary amongst locals but as the evenings grow balmier, the terrace overlooking the pool really comes into its own for dinner and drinks. The use of seasonal and local ingredients is taken very seriously, so expect the Mediterranean/modern British menu to change regularly. Like the venue itself, our meal was unpretentious and inviting yet full of enough special touches to let you know that the chef knows his way around a kitchen. Starters included a wonderful Spanish inspired dish of Mussels in a chorizo, white wine & parsley sauce that thoughtfully came served with slices of sourdough with which to mop up the piquant liquid; and a rich Game terrine served just warm enough so that it melts apart as you cut through it. Mains were a beautifully cooked Roast guinea fowl leg (crisp skin on the outside, soft meat on the inside – heaven! ), served with super-sweet chargrilled baby gem lettuce, peas and pancetta; and Wild silver mullet with roast salsify, fennel, girolles and parsnip puree – a dish that was well cooked but lacking seasoning. Dessert completed the meal with a simple Apple tart with home-made ice cream.